These days I’m finding it harder and harder to truly appreciate pop-punk as a genre. More and more often the music seems to be taking a backseat to the clichés it provokes. 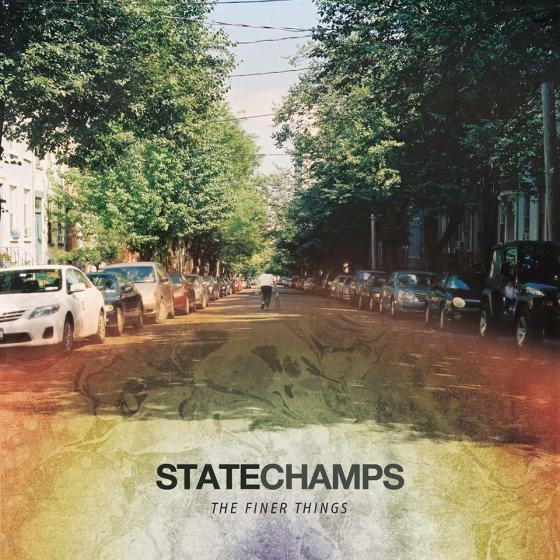 Fortunately, ‘The Finer Things’ by State Champs is all about the music and it was always going to take an album as brilliant as this one to make me fall in love with the genre again. State Champs are a band who’ve been on my radar for a few months now and ‘The Finer Things’ is their first full-length, following the release of the excellent EP ‘Overslept’ and their signing to Pure Noise Records, home of artists like The Story So Far and Handguns. It’s a label perfectly suited for their style of music and the band have managed to release a record that far surpasses their peers in terms of quality. It’s not necessarily that the band bring anything new to the table, it’s just that they take the best qualities of the genres finest and channel them throughout ‘The Finer Things’. Expect trademark sing-along moments, bouncing guitar riffs, vocal hooks aplenty and just an all-round good time. It makes for a record that will sit well with anyone who’s already a fan of the genre and will reel back in those who’ve grown apart from it – like myself. ‘The Finer Things’ is infectious, and it’s impossible not to like it. If you’re already familiar with State Champs then you’ll know that front-man Derek Discanio has quite the set of pipes on him and ‘The Finer Things’ makes excellent use of his vocal ability. His shouting perfectly captures the bands energy and it gives the songs here a very honest and raw feel. There’s a good mix of melody and general angst on songs like ‘Remedy’ and ‘Prepare To Be Noticed’ which contain his best performances. From an instrumental perspective ‘The Finer Things’ is equally excellent. There’s very little filler, even though some songs contain 30 seconds of instrumental build up before any vocals feature. It makes for a varied and technical album, without any songs sounding similar. That energy I mentioned earlier is more apparent here than on any other release this year and the album really is a testament to the bands youthful and contagious nature. There’s never wasted time, throwing in subtle contributions via a drum fill or simple guitar melody, and it makes the whole thing seem polished, with the band making a real effort to deliver at every opportunity. ‘Mind Bottled’ is a great example and was my favourite track. It surges along, being fast and frantic whilst catchy and exhilarating. It’s pop-punk done flawlessly, and the same can be said about every single song on ‘The Finer Things’. There are very few albums on which every track is as good as the one that precedes it, but State Champs have managed it. Opener ‘Elevated’ sets the scene it terms of scope, with a huge chorus and similarly huge vocals. Second track ‘Deadly Conversation’ starts off acoustically before exploding and probably does the best of showcasing State Champs knack for song writing, with accapella vocals featuring and a bouncy bridge. It shows a more creative side to State Champs most bands don’t possess, as well as a willingness to push boundaries in terms of what’s expected of a debut and does so in fine fashion. Two of the songs that previously featured on ‘Overslept’ make an appearance (‘Critical’ and ‘Remedy’) and both have been reworked. I’ve listened to ‘Remedy’ a lot over the last few months and I prefer its redo, being more up tempo and sharp in a sense. Tenth track ‘Critical’ is still as dynamic as ever, designed to be sung at the top of your lungs, which Discanio definitely does. ‘Simple Existence’ is one of the best songs lyrically whilst closer ‘Easy Enough’ is one of the more mellow tracks despite still packing a punch, and is also a fitting note to end on. Ultimately, ‘The Finer Things’ leaves you wanting more and there’s very little to fault here – the songs are accomplished and confident and they’ll go down as the best 2013 has to offer as a result of their quality. State Champs have put together one of the best albums you’re likely to hear this year, and easily 2013’s best pop-punk release. That’s quite an achievement considering this year has produced ‘The Greatest Generation’, but State Champs have bettered it. That becomes even more of an achievement considering it’s their debut album, and I’ve never been more confident when I say that this band are going to be absolutely huge. ‘The Finer Things’ speaks for itself and if you pass it by you’re missing out.